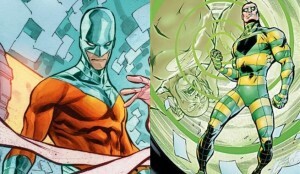 More of Flash’s rogues gallery will be coming to The CW this season as casting is underway for what appears to be Mirror Master, Top, Rose/Thorn, or Magenta. Mirror Master has been a villain many fans have hoped to see pop up somewhere down the line in The Flash, and now that dream is becoming a reality. The Hashtag Show has released character descriptions used in casting for the third season of The Flash, and the first is Sam Scudder, the name of the original Mirror Master. Male, 30s, open ethnicity. A master thief with supermodel looks and an ego the size of the Grand Canyon. Scudder is one of the most charming criminals you’ll ever meet. The only thing he loves more than money is himself. After his sudden, mysterious disappearance three years ago, Scudder has returned to Central City seeking fortune and revenge. Open to offer only / cameo ideas as well. Due to the point about Scudder having disappeared three years ago, we can be led to believe that he was stuck in his on mirror world after the particle accelerator explosion. Next up, we have seemingly a gender-swapped version of the villain Top. In the comics, Top is Roscoe Dillon but here the characters name is Rosland Dillon, pretty similar. Female, late 20s, open ethnicity. There’s crazy and then there’s crazy… and then there’s Rosa. A wild-eyed whirlwind of a woman, this vexing, unpredictable, mentally unstable criminal has a history of violence and a nasty habit of turning people’s worlds upside down. Open to offer only / cameo ideas as well. And finally, we have a character who could either be one of two different rogues. The next casting could either be for Magenta, a Teen Titan who became a rogue, or Rose/Thorn, a silver age villain. While the description appears to be more towards Thorn, it is unclear at this time. Female, 18 or older to play 17, open ethnicity, bright, a good kid, kicked around from foster home to foster home, Francis is now with an abusive foster father, John James, and his submissive wife, Karen. Sick and tired of being hurt, Francis has been having blackouts during which time she becomes her alter-ego, a meta human, who has superhuman strength and a desire for revenge…. Rose was a character who had split personalities, but Magenta’s comic name was Francis, so it could even possibly be a combination of the two characters. The Flash returns to The CW on October 4th.